Chairwoman: Erika Biehn, Verband alleinerziehender Mütter und Väter, Bundesverband e.V. 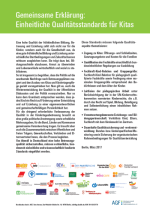 Vice-Chairman: Ulrich Hoffmann, Familienbund der Katholiken e.V. 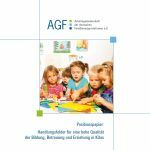 Copyright: Arbeitsgemeinschaft der deutschen Familienorganisationen (AGF) e.V. We will observe your private sphere and data protection as much as possible. No personal data will be stored, unless in accordance with an explicit requirement on your part which encloses the suitable permission necessary (for example, if it is necessary in order to subscribe to available Newsletters or if you send us an email with your e-mail address). The personal information which you send to our e-mail address or via our contact form is used exclusively to answer your email/message, or if ordered, it shall be used, where appropriate for the mailing of available free Newsletters. No personal data (in particular no e-mail addresses) shall be transmitted onto third parties (except where legal obligations to do so exist). We use no Cookies, no systems for tracking of internet browsing history or for the creation of user profiles, and we do not store personal data on the web server (for example, orders of the Newsletters). As per usual on Internet sites, we and our Internet service provider protocol non-personal data of your visits for the purposes of the technical security and administration as well as for completely anonymous statistics for the improvement of the usability of the website. These data shall include the time and date of your visit as well as data which your web browser (user agent) transmits: Browser type, operating system, land, reference source (before visited web address) and your present IP (Internet protocol) address (this is usually a temporary number which your Internet service provider assigns to you if you go on-line). Furthermore inquiries on the searching function of our website shall be stored for a certain period of time. All these data are not connected with personal data (as for example e-mail addresses) and are not transmitted to other parties (except where a legal obligation to do so exists or a hacker\'s attack on the server).We do not try and are not in a position to uncover your anonymity. For technical reasons we cannot guarantee the security of the data which is sent to us by e-mail or via our contact form. You can demand at any time that we delete your personal data from our contact lists (name, e-mail address and further contact data). If you have any questions on our data protection, please don’t hesitate to contact us. may be transmitted to third parties, be reproduced, or republished for information purposes and thus shall not be subject to the payment of royalties, as long as the source is quoted.In cases of transmission in print and other media, we would be grateful to receive news, a link or a documented copy. A mirror server should quote the original source, as well as the date and version of the site as it is given in the original version; in addition, it should be regularly updated. With photographs and graphic arts from external authors as well as with trade names, that are included in the documents, please take into consideration the next two segments. Photography credits are given at the end of the respective page (in the order of the appearance of the pictures). The copyrights of the photographs on this website belong to their owners and are to be respected. The same applies to graphics of external authors. All trade names, trademarks, protected brands, user logos, personality rights or similar rights that are mentioned, used or are quoted in this website, belong to their respectable owners. Although we have provided this Internet site with great care, we assume no juridical guarantee, in particular for content, for externally linked pages as well as for technical security. The information on this website is provided free of charge and it would be inconsiderable to impose guarantee claims on us for it. Our liability is limited to the legal minimum. 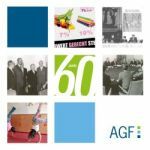 All information and data which the AGF provides in this Internet offer was put together with the best knowledge available. The AGF still assumes no guarantee of it being free from mistakes, its completeness and actuality are not a guarantee, expressly or implied, including (however, not limited to) an implied assurance as to the customary usability, the suitability for a certain purpose or the non-injury of the rights of others. Although we believe that the presented information is correct, it may contain mistakes or inaccuracies. The same applies to all the other Internet pages to which a hyperlink refers to. A link to an external site does not mean that the AGF assume or accept any responsibility for the contents or the use of such a page or website. Via linking to external sites we do not adopt this, and we have no control of their contents or technical security. In no case will the AGF be responsible for someone for direct, indirect, concrete or secondary damage from the use of this website or a linked website, including and without limitation to profit received, disturbance of the business concern, loss of programs or other data on their information-processing system or in other way, even if the possibility of such damages was expressly pointed out to the AGF. In case you find something on our website which possibly injures your rights, the law or the rights of other persons, brand owners, owners of copyrights etc. please do inform us. We will quickly check the circumstances, also in situations where something is forbidden, to avoid every injury of rights. There is no necessity for a warning pertaining to the liability to pay costs. Many thanks. We can rework this document every now and then. Below this text you will find the date of the last change of its contents. This document describes the whole arrangement between you and the AGF concerning your use of our website, and it substitutes all previous relevant arrangements. This document is subject to German law and is to be laid out in accordance with it. All disputes regarding this document are exclusively subject to the administration of justice in the German jurisdiction. The relevant jurisdiction is Berlin, Germany.